It's my turn to teach preschool next week, and I still haven't decided which picture book to base our lesson on. However, in my search for the perfect book (our theme for next week is space if you have any good suggestions! 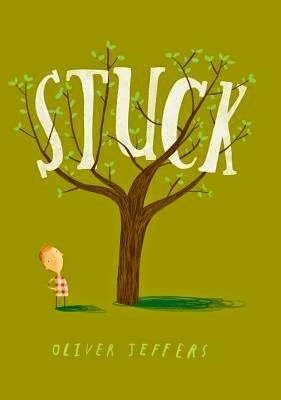 ), I stumbled across an old favorite: Stuck by Oliver Jeffers. I know I'm not alone in my admiration for Oliver Jeffers' work, and this one might well be my very favorite (although he has a new one out this year (Once Upon an Alphabet) that I'm dying to take a look at). It's about a boy named Floyd who is spending a carefree day flying his kite when he steers it a little too close to a tree and, as kites often do, it gets stuck. So Floyd does the only thing he can think of: he throws his shoe at it to knock it loose. But that gets stuck, too. Without giving it much thought, Floyd begins chucking anything he can get his hands on up into the tree: a bucket of paint, a ladder, a chair. And they all get stuck. Gradually, the items being launched get bigger and more and more ridiculous until there is no more room left in the tree, and then . . . well, you'll have to read it to find out what happens. The story travels from the likely (what kid hasn't thrown something--be it kite, ball, or frisbee--and gotten it stuck?) to the far-fetched (a kitchen sink? really?) to the truly unbelievable (I'm going to draw the line at the blue whale). Because it begins with such an ordinary event, the subtle transition to the absolutely ridiculous is all the more hilarious: a cat is pretty funny, but the mailman? Now that's funny. The illustrations, which look like they've been lifted from a sketchbook and then enhanced with color and detail, are wonderfully original. Who would have thought you could fit a house, a big boat, and a lighthouse, along with a dozen and more other things, into a tree? My kids are amazed every time we read this book: no, there's no way, no possible way, that's going into the tree! whoa, I never would have believed it . . . It's quite the feat of imagination and skill to get that many objects into one tree. This is one of those books I can read to my kids again and again and never complain about because it's funny, it's not too long, and the pictures give a little more each time. P.P.S. And, to be inspired by other people much more creative than me, take a look at this adorable dress inspired by the book, complete with detachable items. P.P.P.S. Have you read this book before? What's the craziest thing you (or your kids) have gotten stuck in an unreachable place?